Eli Begent (Baigent) was born in 1789 in Farnborough, England, near the bourder of the counties of Surrey, Hampshire and Berkshire. He was a convicted at the Berkshire Assizes on 22 July 1811 for sheep stealing and sentenced to be hanged. This was later commuted to transportation to Van Diemen's Land (Tasmania) where he arrived on 4 June 1812. He married in 1820 and became a freeman. He and his wife Mary had 8 children and their descendants live in Tasmania and Australia. Below is a transcript of his trial from the records of the Berkshire Assizes in 1811. It shows how different 'justice' was then and makes fascinating reading. Berks - The disposition of Joel Jarvis of (?Keech - overwritten and illegible) Frimley in the county of Surrey labourer, who on his oath saith that on or about the 23rd. of January last between the hours of two & three o'clock in the morning he saw Eli Baigent (now or late of Easthampstead or Warfield in the county of Berks) in a five acre field called Pond Close at Finchampstead in the said county which close is in the occupation of Farmer James Walden that deponent saw the said Eli Baigent drive the sheep with a small dog into a corner of the field where some hurdles were set up for the purpose of parting off the turnips & that he there caught eight sheep one after another that he turned the first (illegible word) adrift that he took a knife out of his pocket & struck the eight sheep & killed it that he then took it up on his arms & carried it over the hedge of the field into the ajoining close call Furzy Moor where he got out of deponent's sight by going into a coppice or underwood which is there situate, that deponent then got over the hedge of the turnip field & got into the said close called Furzy Moor & walked up and down the side of the said coppice or underwood for about half an hour that said Eli Baigent then came out of the coppice into the moor with a sack on his shoulders & the skin of a sheep upon the sack that the sack appeared to have something in it that he went with his load & the dog following him out of the Moor gate into the lane which leads to the heath that deponent followed him at about 30 yards distance that he overtook him when he had got about 200 or 300 yards upon the heath near the plantation of Charles Fyshe Palmer Esq. that deponent there came up to within about 10 yards of said Baigent who then set the sack down and hid the skin in some furzes, that he then took it out again & carried it into the plantation of firs & there left it, that whilst he was gone the deponent went up to the sack & emptyed it and found in the sack the body of a sheep (with the head cut off) & which was then warm that deponent then went towards that part of the plantation where he saw Baigent enter it & met him coming out, that he then spoke to him & called him by his name, to which he answered & said that he was very sorry to see deponent there & deponent told him he was likewise sorry to see him there, that Baigent then told deponent that anything that he desired he (Baigent) would give him, that deponent told him he did not want any thing , but desired to go about his business, that deponent then went away towards home & saw said Baigent go towards the place where the sack was left - And this deponent further saith that about three weeks afterwards between the hours of twelve at night and 3 in the morning he saw the said Eli Baigent catch with a dog another sheep in the same turnip field and take it upon his back & carry it away out of the field, that deponent knew said Baigent and his dog but did not speak to him. Berks - The information & complaint of James Walden of Finchampstead in the said county yeoman. Who on his oath saith that in the nights on the 22nd January and the 12th February last or early in the mornings following he lost from his field at Finchampstead called Pond Close two six tooth wether sheep that he found both their skins early in the morning of the said 23rd January and 13th of February last hid in Mr. Palmer's plantation of firs at Finchampstead aforesaid & that he doth suspect that Eli Baigent late of Easthampstead or Worfield did steal & carry away this informant's said two sheep. One wether sheep of the price of thirty shillings of the goods and chattels of James Walden then and there being found feloniously did take steal and carry away against the peace of our said Lord the King his Crown and Dignity. The names of the Jurors sworn to inquire for our Sovereign Lord the King and the prisoners at the Bar. Eli Beagent ..... For stealing on 23rd. Jan. last a wether sheep price 30 sch the property of James Walden. Shortly afterwards the Court reprieved Eli and two others from hanging on condition that they be transported to the 'Coast of New South Wales or some one or other of the islands adjacent'. Whereas Richard Maskell, John Holmes and Eli Beagent were at this Assizes severally attained of sheepstealing but his Royal Highness the Prince Regent for and in the name of his Majesty hath been graciously pleased to extend his Royal Mercy to them respectively on condition of their being severally transported to the coast of New South Wales or some one or other of the islands adjacent for and during the whole term of their respective natural lives. It is therefore ordered by this court that the said Richard Maskell, John Holmes, Eli Beagent be transported accordingly as soon as conveniently may be pursuant to the several Acts of Parliament in this case soon as conveniently may be pursuant to the several Acts of Parliament in this case made and provided and that Charles Dundas and Edward Thornhill Esquires two of his Majesty's Justices of the Peace for the said County of Berks do contract with any person or persons for the performance of the Sd transportation and order such and the like sufficient security to be taken as the said Acts of Parliament direct. And also cause the said several above named persons pursuant to such contract or contracts to be delivered over by the gaoler of the said County of Berks (in whose custody they now are) to the person or persons contracting for them or to his or their assigns and certify such contract or contracts and security so to be taken at the next Assizes and general gaol delivery to be holden for the said County of Berks in order to have the said certificate and contract or contracts and security filed away among the records of this court. Eli arrived in Van Diemen's Land (Tasmania) on board the ship "Indefatigable" on 19 October 1812 having left London on 4 June 1812. This was one of the first convict ships to arrive in Tasmania - click on Indefatigable for details of the voyage from the Tasmanian Records and on Tasmanian Convicts where he is listed as Eli Beagent. He was assigned as a convict servant to Edward Abbott, Deputy Judge Advocate. When Abott gave evidence at the Biggs commision in March 1820, he stated that Eli Begent had been his servant for four years, and after leaving Abott's service had been in league with bushrangers. 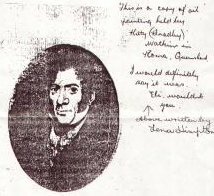 In around April 1818 Eli was allegedly involved in a plot with others to transport a bushranger named Michael Howe by boat to the Australian mainland. Howe had also arrived on the Indefatigable and had a price on his head. The plot was discoverd and Eli was apprehended while trying to escape in an American brig. He had then been sent to Sydney. Abott had obtained a ticket-of-leave for Eli because his conduct during his years with him had been good, and it was Eli Begent's intention to marry a free women, Mary Glover, who had come to the colony with the Abott family. On 18 May 1819 Eli married Mary Glover who was born on 2 May 1799 at Trottiscliffe, Kent. She was the daughter of John Glover and Sarah (Cutcher) m. 11 Oct 1792, in Wrotham Kent. Mary Glover emigrated to Hobart Town on the "Emu", 12 February 1815 with Abbott as a Lady's Maid to Mrs Abbott and 3 children. She later went to Sydney where she was engaged as a Nursemaid for Governor Macquarie's (he came from and is buried on the Isle of Mull) family. She married Eli while in Sydney on 18 May 1819 at St Phillips C of E. Both were servants of the Governor's at the time of their marriage. Eli became a free man and they returned to Hobart on HM Brigg "Princess Charlotte" on 16 May1820 and later settled at Georgetown north of Launceston at the head of the Tamar River. When their fourth child was born 6 Sept 1828, Eli was listed as a Fisherman. They had 8 known children. This picture is of his daughter Emma Jane Begent born 6 Feb 1835 in Georgetown, died 21 May 1926 in Launceston. In mid 1824 Eli was farming at Tea Tree Bush (near Hobart) and he had at least one assigned servant (Hobart Town Gazette 16 July 1824). Eli's name is mentioned in a list of unclaimed grants as being entitled to 503 acres, published in the Hobart Town Gazette of 26 August 1826. In the Census of 1843 - Eli's family were all members of the C of E and occupied a wooden house in Elizabeth St Georgetown. This is a transcript of an article that appeared in the Launceston Examiner, Wednesday January 14 1846. Bejent with his son Clarence sailed from the wharf, and when forging ahead of Garden Island, a whirlwind came curling along the water, and drove the boat into one of those eddies occasioned by the tide at the entrance of George Town Cove; to save the boat from swamping the boy turned her over; both father and son were excellent swimmers and anticipated floating safely to Windmill Point on the bottom of the boat; but they had forgotten the kelleck stone attached to the boat by about sixty-five yards of rope. The weather was boisterous and the sea rough, and every time the boat fell into the trough of the waves the stone touched the bottom, and the boat disappeared. Bejent's son dived and attempted to cast off the rope from the thwarts of the boat, but without success: the boat drifted slowly along with the weight attached, and it was only at intervals they could reach the keel so as to rest for a moment. Every few minutes the boat disappeared and rose again as the stone was lifted off the bottom by a rolling wave. The exhaustion consequent on his perilous situation, and the apparent impossibility that he could maintain himself above water induced Bejent to advise his son to regain the shore; he said that if both remained they must be lost, it was better the old man should perish rather than the young. He declined the support of his son, which had hitherto been afforded, and pushed him aside, so that the boy might not be drawn down in attempting to save his father. He implored his son again and again to make for the shore, which he could easily reach. But Clarence was not driven from his aged parent by entreaty, or force. If we perish father, he said we perish together, and - resolved to sustain him to the last - the boy resumed his auxiliary position. "The short but simple annals of the poor" are sometimes deeply affecting. The parental affection of the father and the noble heroism of the son deserve to be recorded. The courage and perseverance, accompanied by a display of the finest feelings in the most trying circumstances discoverable in the conduct of the youth, would illustrate the character of the greatest man that ever existed. It is gratifying to be able to record that his exertions were rewarded - that the lives of both were saved. A four-oared boat put off from the shore to their assistance: another followed, occupied by a free man and a prisoner belonging to the marine department, named Lachlan Mackintosh, which soon outstripped it's predecessor, and by almost superhuman exertions overtook Bejent and his son off Mr Barnes' house, just in time to save them from sinking. The men in the boat, when they reached the spot, had scarcely strength to draw the objects of their compassion on board. Nothing has been done for Mackintosh. His generally excellent, and in this instance exemplary conduct, can be attested by Mr Dryburgh and others: and to complete the incident to the satisfaction of all parties, the government should confer some indulgence on a man who, by his prompt, severe, and disinterested exertions, saved two fellow-creatures from an untimely grave. Eli Begent's Death Notice appeared in the Launceston Examiner dated 29 August 1854. On 27th August at his residence, George Town, after a long and painful illness, which he bore with Christian fortitude, Mr Eli Begent, in the 75th year of his age, one of the oldest residents in the colony. There is a discrepancy of at least three years in his age as given in the 1843 census and his death notice. The entry for Eli Beagent in the Convict Conduct Registers is blank, which indicates that he had rec'd his freedom before 1827, the date these registers were written up from earlier records. Eli was buried at Georgetown. Mary died at the residence of her son, Clarence at Westcombe St Launceston on 27 April 1886 aged 87 years. Obituary for Mary Begent, widow of Eli Begent. Launceston Examiner dated 28 April 1886. Born Kent 2 May 1799, Mary emigrated to Tasmania with Edward Abbott as Lady's Maid; in Government 10 gun Brig "Emu" in 1816. Later went to Sydney and was nursemaid to Governor Macquarie. She married Eli Begent and returned to Tasmania in 1819. Picture of Eli from a oil painting held by Kitty(Bradley) Watkins in Roma Queensland. Copy supplied via Lena Kimpton.